They are classified by their height because the taller the height, the longer the strings and the larger the soundboard area. Longer strings and a larger soundboard result in a fuller, louder and better developed sound. 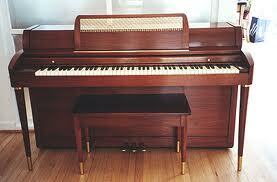 A "spinet" piano is the shortest vertical piano. It is between 35" and 39" tall. Spinets feature a "drop" key action which is different from larger uprights. A "console" piano is the next size up, generally 40" to 43" tall. A "studio" piano is 44" to 47". An "upright" is 48" and up. These tall pianos are also called cabinet grand or upright grand because the string length and soundboard area are comparable to that of a baby grand. Grand pianos are classified by their overall length on the long end (the bass end of the piano). The measurement is taken all the way from the tip of the key cheek to the apex of the curve (in a straight line). A petite baby grand is the smallest. These are most often Chinese-made and range in size from 4'6" to 5'0". 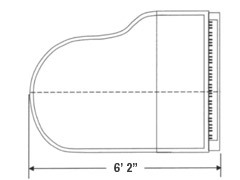 A baby grand is 5'0" to 5'8". A medium or living room grand is 5'9" to 6'6"
A semi-concert grand is 6'7" to 7'8"
A concert grand is 7'9" or longer. Most concert grand pianos are 8'11" or longer.